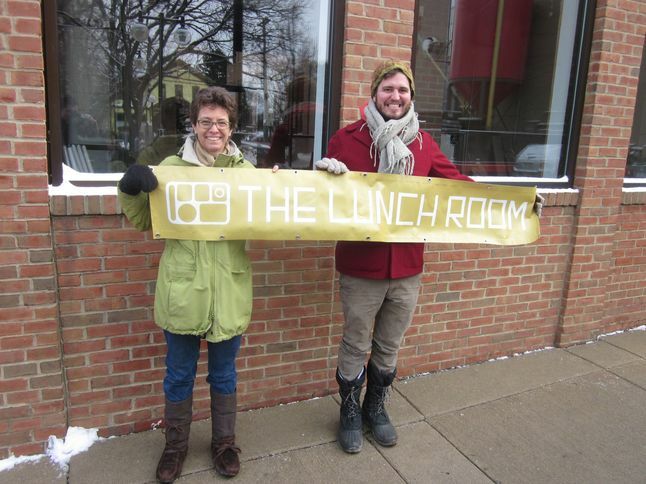 Posted on Mon, Feb 4, 2013 : 6:13 p.m.
Phillis Engelbert and Joel Panozzo outside their new permanent location for vegan restaurant, The Lunch Room. It’s official: Vegan food cart The Lunch Room is opening a permanent restaurant in Ann Arbor’s Kerrytown neighborhood. At an event on Monday night, owners Phillis Engelbert and Joel Panozzo announced to a group of about 100 people that they signed a lease for the former Yamato restaurant space at 403 N. Fifth Ave. in the Kerrytown Market & Shops. It’s located between Everyday Wines and Zingerman’s Events. "Opening a restaurant has been a long time dream of ours," Panozzo added. 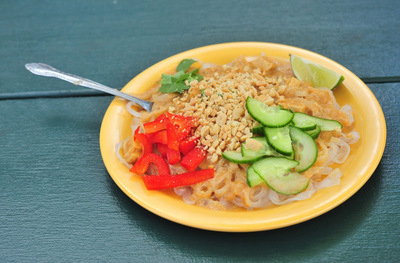 One of the popular dishes from The Lunch Room is its Pad Thai, with tofu and vegetables. The Lunch Room worked with Ann Arbor’s Trillium Real Estate to find the space. As vegan foodies and next-door-neighbors, Engelbert and Panozzo worked their way from cooking for private parties in Ann Arbor and Ypsilanti, to owning a food cart at Mark’s Carts outdoor food courtyard, to eventually owning their own restaurant. As a food vendor at Mark’s Carts, The Lunch Room garnered a loyal following with its popular barbecue tofu sandwiches, pad Thai, bahn mi and vegan cookies. Its plant-based menu items are made from scratch using locally sourced food products. 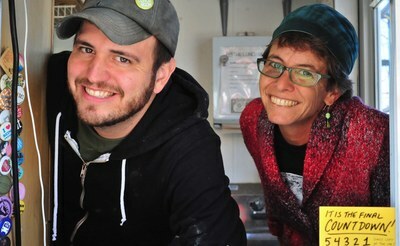 The Lunch Room owners Joel Panozzo and Phillis Engelbert, pictured at their food cart in 2012. 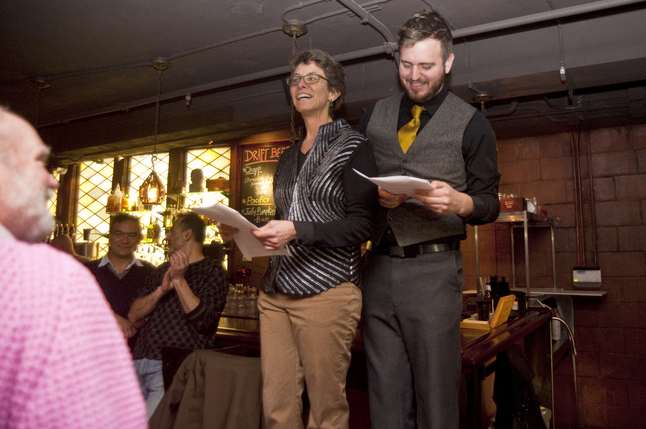 "Building a community through food has always been our motivation," Panozzo said. The Lunch Room restaurant is expected to open in June, and it will serve breakfast, lunch, and dinner, along with weekend brunches. According to a new release, menu items will include: veggie burgers, tacos, roasted root veggie pasties, tempeh reubens, udon noodle seitan stirfry, breakfast burritos, French toast, cauliflower-spinach frittata, potato pancakes, and gluten-free items, among others. Rotating specials will include pizza, paella, veggie sushi and panang curry. Fresh-squeezed fruit juices, smoothies, root beer floats, Boston coolers and ice cream sundaes also will be available. The restaurant will have a display case with The Lunch Room’s cookies, pies and pastries. After Yamato Japanese restaurant closed in early 2012, Kerrytown Market & Shops manager Karen Farmer said she “patiently waited for the right fit” for the space. Renovations will incorporate “elements of indoors and outdoors to enhance the dining experience,” the release says. Ann Arbor’s Synecdoche is designing the space with plant artist Andy Sell. Watch the video of The Lunch Room's restaurant announcement below. The Lunch Room co-owners Phillis Engelbert, left, and Joel Panozzo, right, announce their new location for their restaurant The Lunch Room. Fri, Feb 15, 2013 : 3:38 p.m. Hooray!!!!!! I can hardly wait! I've been hoping for this for a LONG time! Wed, Feb 6, 2013 : 12:20 a.m. YEAH!!!! I am so happy for you and so proud of you both!!! and I can't wait, ever so selfishly, to come visit you and share in the joy of our vegan lives :+))! Looking forward to supporting and helping where I can! Tue, Feb 5, 2013 : 5:11 p.m. SO excited. I miss their Bahn Mi! Tue, Feb 5, 2013 : 2:30 p.m.
Tue, Feb 5, 2013 : 5:45 a.m. Hurray!! As a veggie, this makes me happy! I love their food!! Tue, Feb 5, 2013 : 12:37 a.m. There are so many positive things about a plant-based diet. Glad to see a place like the Lunch Room committed to bringing something so positive to Ann Arbor! Win-win-win-win. Can't wait to try every one of the dishes mentioned! Tue, Feb 5, 2013 : 12:35 a.m.
Tue, Feb 5, 2013 : 12:16 a.m.
Mon, Feb 4, 2013 : 11:47 p.m.